These buildings are fired using a technique known as raku. This process may have originated in mediaeval Japan where it was part of the elaborate tea ceremony. At the beginning of the tea ceremony an itinerant potter with a portable kiln would be present so that the participants would be able to make their own tea bowl. The contemplation of the qualities of the resulting bowl was an integral part of the ceremony. 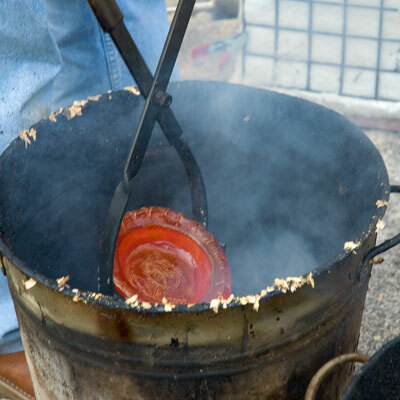 The raku process involves heating the pieces up to 1000 degrees Centigrade and removing them, directly, from the kiln. They are then plunged into a reducing agent, in my case sawdust, and left to smoulder before being plunged into cold water. Because many of the glazes have metal oxides in them the reducing effect of the sawdust makes them want to turn back to metal. This gives rise to the metallic lustres. The rapid changes of temperature cause cracking and smoking effects which are all peculiar to raku and mean that no pieces ever come out the same!